Planning your conditional access deployment is critical to make sure you achieve the required access strategy for apps and resources in your organization. You should spend most of your time during the planning phase of your deployment to design the various policies you require to grant or block access to your users under the conditions you choose. This document explains the steps you should take to implement secure and effective conditional access policies. Before you begin, make sure you understand how conditional access works and when you should use it. Think of conditional access as a framework that allows you to control access to your organization’s apps and resources, instead of a stand-alone feature. Consequently, some conditional access settings require additional features to be configured. For example, you can configure a policy that responds to a specific sign-in risk level. However, a policy that is based on a sign-in risk level requires Azure Active Directory identity protection to be enabled. If additional features are required, you might also need to get related licenses. For example, while conditional access is Azure AD Premium P1 feature, identity protection requires an Azure AD Premium P2 license. There are two types of conditional access policies: baseline and standard. A baseline policy is a predefined conditional access policy. The goal of these policies is to make sure that you have at least the baseline level of security enabled. Baseline policies. Baseline policies are available in all editions of Azure AD, and they provide only limited customization options. If a scenario requires more flexibility, disable the baseline policy, and implement your requirements in a custom standard policy. In a standard conditional access policy, you can customize all settings to adjust the policy to your business requirements. Standard policies require an Azure AD Premium P1 license. Azure Active Directory conditional access enables you to bring the protection of your cloud apps to a new level. In this new level, how you can access a cloud app is based on a dynamic policy evaluation instead of a static access configuration. With a conditional access policy, you define a response (do this) to an access condition (when this happens). Helps you to outline the responses and conditions for each policy. Results in a well-documented conditional access policy catalog for your organization. You can use your catalog to assess whether your policy implementation reflects your organization's business requirements. At a minimum, when this happens defines the principal (who) that attempts to access a cloud app (what). If necessary, you can also include how an access attempt is performed. In conditional access, the elements that define the who, what, and how are known as conditions. 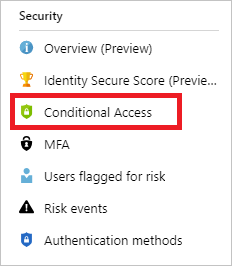 For more information, see What are conditions in Azure Active Directory conditional access? With then do this, you define the response of your policy to an access condition. In your response, you either block or grant access with additional requirements, for example, multi-factor authentication (MFA). For a complete overview, see What are access controls in Azure Active Directory conditional access? The combination of conditions with your access controls represents a conditional access policy. For more information, see what's required to make a policy work. While a descriptive name helps you to keep an overview of your conditional access implementation, the sequence number is helpful if you need to reference a policy in a conversation. For example, if you talk a fellow administrator on the phone, you can ask him to open policy EM063 to solve an issue. ENABLE IN EMERGENCY at the beginning to make the name stand out among the other policies. The name of disruption it should apply to. An ordering sequence number to help the administrator to know in which order policies should be enabled. When planning your conditional access policy solution, assess whether you need to create policies to achieve the following outcomes. If you want to block access for all users, you should at least exclude one user (typically emergency access accounts) from the policy. For more information, see select users and groups. To simplify the sign-in experience of your users, you might want to allow them to sign in to your cloud apps using a user name and a password. However, typically, there are at least some scenarios for which it is advisable to require a stronger form of account verification. With a conditional access policy, you can limit the requirement for MFA to certain scenarios. From network locations, you don't trust. Addressing the sign-in risk as condition is the preferred method because it gives you more customization options. The user risk level is only available as user risk policy in identity protection. For more information, see What is Azure Active Directory Identity Protection? The proliferation of supported devices to access your cloud resources helps to improve the productivity of your users. On the flip side, you probably don't want certain resources in your environment to be accessed by devices with an unknown protection level. For the affected resources, you should require that users can only access them using a managed device. For more information, see How to require managed devices for cloud app access with conditional access. One of the first decisions you need to make for bring your own devices (BYOD) scenarios, is whether you need to manage the entire device or just the data on it. Your employees use mobile devices for both personal and work tasks. While making sure your employees can be productive, you also want to prevent data loss. With Azure Active Directory (Azure AD) conditional access, you can restrict access to your cloud apps to approved client apps that can protect your corporate data. For more information, see How to require approved client apps for cloud app access with conditional access. Azure AD supports several of the most widely used authentication and authorization protocols including legacy authentication. How can you prevent apps using legacy authentication from accessing your tenant's resources? The recommendation is to just block them with a conditional access policy. If necessary, you allow only certain users and specific network locations to use apps that are based on legacy authentication. For more information, see How to block legacy authentication to Azure AD with conditional access. Before rolling out a policy into production, you should test is to verify that it behaves as expected. To test a policy, create a set of users that is similar to the users in your environment. Creating test users allows you to verify that your policies work as expected before you impact real users and potentially disrupt their access to apps and resources. Some organizations have test tenants for this purpose. However, it can be difficult to recreate all conditions and apps in a test tenant to fully test the outcome of a policy. The test plan is important to have a comparison between the expected results and the actual results. You should always have an expectation before testing something. The following table outlines example test cases. Adjust the scenarios and expected results based on how your CA policies are configured. Managing conditional access policies is a manual task. In the Azure portal, you can manage your conditional access policies in one central location - the conditional access page. One entry point to the conditional access page is the Security section in the Active Directory navigation pane. Become familiar with the user interface. Get a first impression of how conditional access works. While a simulated run gives you impression of the impact a conditional access policy has, it does not replace an actual test run. Run test cases according to your test plan. In this step, you run through an end-to-end test of each policy for your test users to make sure each policy behaves correctly. Use the scenarios created above to execute each test. It is important to make sure you test the exclusion criteria of a policy. For example, you may exclude a user or group from a policy that requires MFA. You should therefore test if the excluded users are prompted for MFA, because the combination of other policies might require MFA for those users. 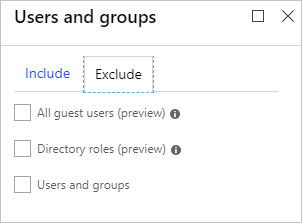 Remove the assigned users and groups. Provide internal change communication to end users. Start with a small set of users and verify that the policy behaves as expected. When you expand a policy to include more users, continue to exclude all administrators. Excluding administrators ensures that someone still has access to a policy if a change is required. Apply a policy to all users only if it's required. Disable the policy - Disabling a policy makes sure it doesn't apply when a user tries to sign in. You can always come back and enable the policy when you’d like to use it. This option should be used sparingly, only in situations where the user is trusted. The user should be added back into the policy or group as soon as possible. Delete the policy - If the policy is no longer required, delete it. Check out Azure AD Conditional Access Documentation to get an overview of the available information.